With Australia’s rainfall becoming more and more erratic and with prolonged drought periods affecting many parts of the country, capturing a free natural resource should be on everyone’s “To Do” list. On average, each Australian uses about 200 litres of water per day, of which 5-10 litres is drinking and food preparation. The other 190 litres is discretionary and is used for washing (showers, dishes, clothes, toilets) and the garden. Savewater.com.au notes that approximately half the water supplied to urban areas in Australia ends up as waste water! These statistics illustrate why rainwater harvesting is so important. Rainwater harvesting collects rainwater before it has the chance to head down storm water drains and is usually collected from rooftops in urban areas. Rainwater harvesting (or collecting) is usually done with the help of storage tanks, reservoirs, or our solution Flexitank’s RainPac. Water is stored in these tanks or pillows until needed. Using captured rainwater will reduce your water bills. Collecting rainwater prepares your household for low rainfall periods meaning you can still water your garden using collected rainwater despite water restrictions in your area. Capturing rainwater reduces the load on storm water systems because roof runoff is not flushed into drains. Using rainwater better utilises a natural resource. Drinking water is not easily renewable and it helps in reducing wastage. Rainwater is free from many chemicals found in ground water, making it suitable for irrigation and watering gardens. Harvested water is a great idea for property owners in bushfire prone areas who may need an emergency supply of water to combat bush fires. Rainwater can be used for several non-drinking functions including flushing toilets, washing clothes, watering the garden, washing cars. RainPac rainwater bladder tank harvesting systems are the perfect solution for rainwater storage. RainPac rainwater bladders are the preferred flexible bladder solution for homeowners, exterior designers, architects, landscapers and hydraulic engineers around Australia. 100% Australian made by Flexitank, RainPac is manufactured using the highest quality fabric and fittings, offering the peace of mind of a successful, elegant product offering. RainPac saves you money, giving you the satisfaction of knowing you have a superior quality product that is backed by our rich 35 years of manufacturing history, and with our 10 year product warranty, providing you many years of hassle free, smooth service. 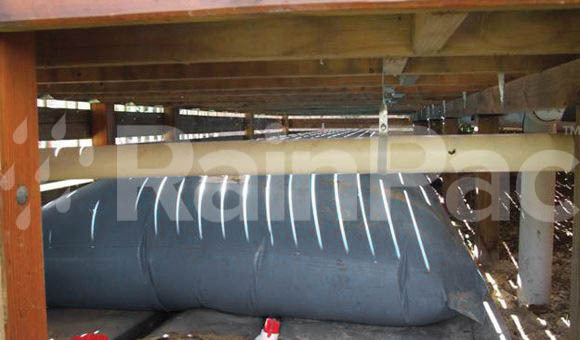 RainPac under house rainwater bladder tanks have now been on the market for close over 11 years, delivered with an exceptional level of engineering and manufacturing success, as highlighted by our recent site visit to a recently purchased home with RainPac bladders installed. 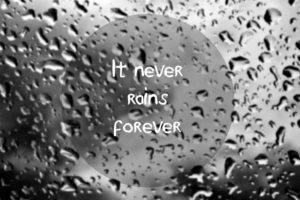 RainPac – because it never rains forever.